Kennady Diamonds Inc. (TSX-V: KDI) added 7% on Thursday after announcing the first new kimberlite discovery at the its 100%-owned Kennady North diamond project. According to the Toronto-based company's CEO Patrick Evans "the new geophysical targets that we are testing bear a close resemblance to the known kimberlites at both Kennady North as well as the neighboring Gahcho Kué JV between De Beers Canada and Mountain Province Diamonds. Mountain Province has announced the discovery of 55 new geophysical targets at the Gahcho Kué joint venture, of which approximately 40 have been classified as high priority." Exploration at Kennady North commenced in the late 1990's and resulted in the discovery of the diamond-bearing Kelvin, Faraday and Hobbes kimberlites. By early afternoon the miner was trading up 7% at $1.07 on the Toronto venture board. The mining sector was generally positive on the day with the TSX S&P Global Mining index up 1.7%. The tightly-held counter has more than doubled since the start of the year. TORONTO, July 19, 2012 /CNW/ – Kennady Diamonds Inc. ("Kennady Diamonds", the "Company") (TSX-V: KDI) is pleased to announce the first new kimberlite discovery at the Company's 100 percent-controlled Kennady North diamond project. The discovery was made at a geophysical target located at Faraday Lake on trend between the previously discovered Faraday and Kelvin kimberlites. An incline hole drilled from shore intersected kimberlite first at a down-hole depth of approximately 47 meters and has continued to intersect kimberlite to the current depth of approximately 169 meters. Drilling has been stopped in order to survey the drill hole following which it will recommence and continue until the hole exits kimberlite. Commenting, Kennady Diamonds CEO, Patrick Evans said: "It is very encouraging that we have discovered the first new kimberlite at Kennady North within ten days of the start of our summer drill program. It is also extremely encouraging that we appear to have made a wide intercept along a kimberlite corridor that already hosts known diamond-bearing kimberlites." As part of the summer drill program, two drill rigs have been mobilized to Kennady North with one drill rig focused on drilling along the Kelvin-Faraday kimberlite corridor, where the first new kimberlite has been discovered, and the second focused on approximately 12 newly discovered high-priority geophysical targets that are accessible from land during summer. Mr. Evans added: "The new geophysical targets that we are testing bear a close resemblance to the known kimberlites at both Kennady North as well as the neighboring Gahcho Kué JV between De Beers Canada and Mountain Province Diamonds. Mountain Province has announced the discovery of 55 new geophysical targets at the Gahcho Kué joint venture, of which approximately 40 have been classified as high priority." Kennady Diamonds controls 100 percent of the Kennady North project which comprises thirteen leases and claims located to the west and north of the four leases controlled by the Gahcho Kué Joint Venture between De BeersCanada (51%) and Mountain Province (49%) located in Canada's Northwest Territories. Exploration at Kennady North commenced in the late 1990's and resulted in the discovery of the diamond-bearing Kelvin, Faraday and Hobbes kimberlites. The number of diamonds recovered from these kimberlites and the size-frequency distribution indicate that they may be of comparable grade to the 5034 (1.77 carats per tonne) and Hearne (2.10 carats per tonne) kimberlites at the Gahcho Kué JV. Exploration samples from Kelvin and Faraday returned a relatively large number of macro diamonds with the two largest being a 0.4 carat diamond from Faraday and a 0.09 carat diamond from Kelvin. The known kimberlites at Kennady North do not explain all the kimberlitic indicators previously recovered from glacial till sampling. 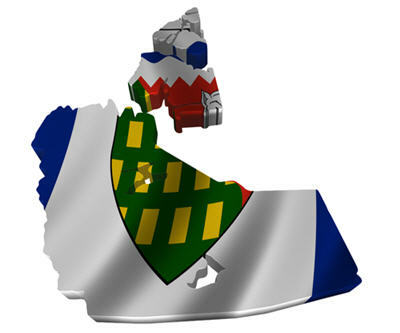 Exploration at Kennady North was suspended in 2004 when Mountain Province focused its attention on the Gahcho Kué pre-feasibility and feasibility studies. Exploration at Kennady North recommenced during 2011 with a 50-meter line-spacing airborne gravity gradiometry (AGG) survey over the entire 123.6 square kilometer project area. The survey identified 106 geophysical targets. Mountain Province recently completed a 560-line-kilometre total magnetic field (MAG) ground survey over all 106 geophysical targets identified by the AGG survey. The 39 high priority targets identified through the AGG and MAG surveys will be drilled as part of the current summer drill program (approximately 20 drill targets) and 2013 winter drill program (approximately 20 drill targets). For further information:Kennady Diamonds Inc.